I have so enjoyed being on the Twisted Sketches Layout Team for the last six months. The twist on this sketch was "jewel". I never find it difficult to put a little bling on my layouts. 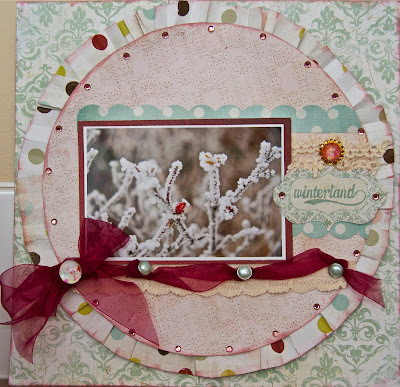 This layout was created with the new Fancy Pants "Wonderland" collection. 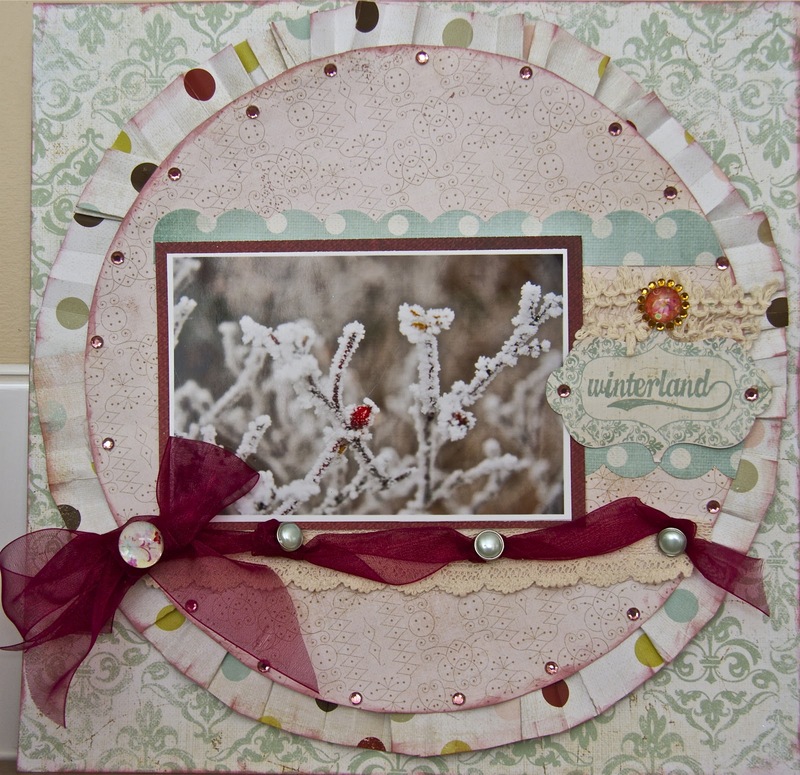 I love the soft colors in this collection and had the perfect photo to scrap with it. You can find the sketch here. Come follow along with us and take a break from the craziness of Christmas. 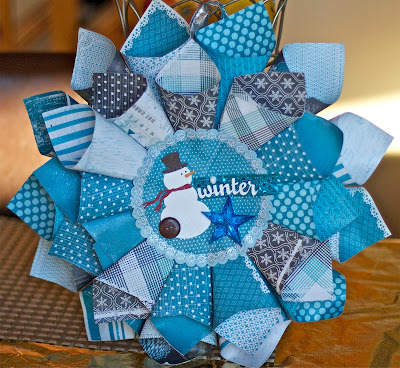 Here is a great way to use ribbon from your stash. A ribbon tree! I made this one last night using a 12 inch styrofoam cone tree, four different types of ribbon, a poinsettia flower pick, a ruler, scissors and a hot glue gun. Measure and cut 4 inch pieces of ribbon. 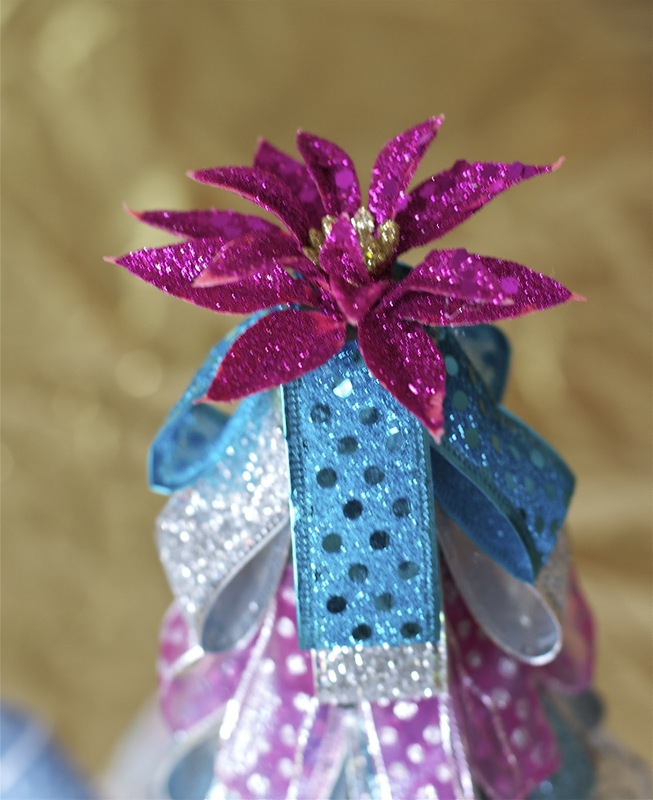 I used 5/8 inches wide ribbon in silver and blue and 1/2 inch wide ribbon in pink. Starting at the bottom of your styrofoam cone, fold ribbon in half and either use a pin or a dab of hot glue on each piece. 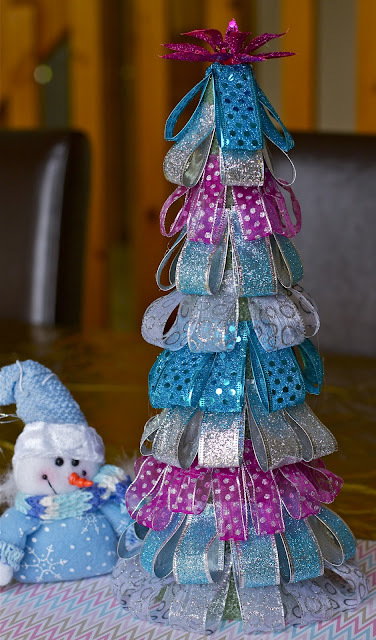 Go around the tree and hot glue pieces onto styrofoam. 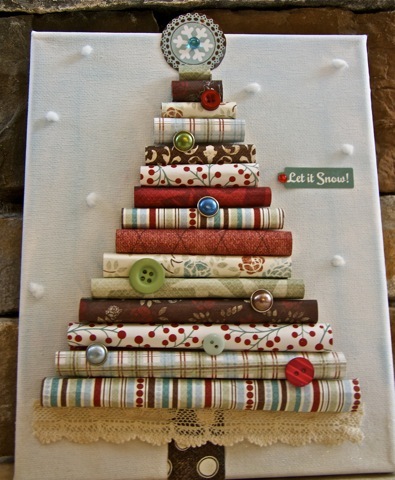 Keep adding ribbon until you reach the top of the tree. Take your poinsettia pick and stick it into the top of the styrofoam tree. It is a little time consuming, but worth it in the end. I like using non-traditional colors for Christmas decorating. I think I will give my Mom this one for her front entrance as she has the perfect table to display it on. 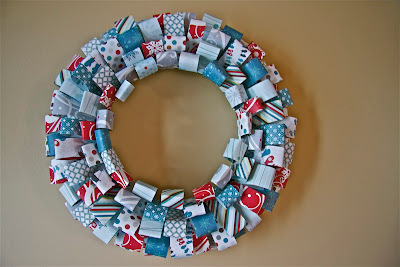 I am on a wreath kick these days and I wanted to use up some scraps of paper so a loopy wreath was the way to do this. Echo Park is one of my favorite scrapbooking paper manufacturers and I had some scraps left over from last year from their "Wintertime" collection and this year they have a winter collection named "Winter Park". It was easy to combine these two collections as the colors are very similar. Our Canadian winters are long so it is a good way to decorate the home for the winter season. 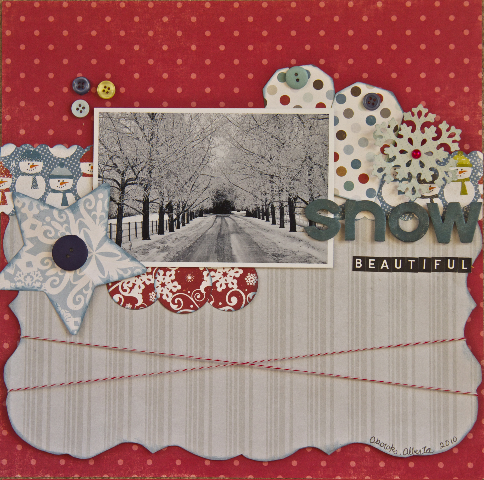 This layout was done with Fancy Pants "It's The Little Things" collection. First I distressed the edges and cut a frame from the paper. I made the rosettes from a Tim Holtz Rosette die, the sheer flower was one of my own creations using a Bounce fabric softener sheet, Stickles and a Prima jewel. 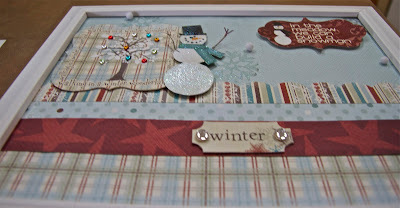 The vintage buttons are from Jenni Bowlin and the pearls from Kaisercraft. I painted the Maya Road Chipboard Letters with a Ranger Paint Dabber in the color "Pool" and rolled a text roller stamp on top of the painted chipboard letters. Lastly, I wanted to give it some texture so I adhered some lacy ribbon, painted a little area and used some rubons from the same Fancy Pants collection. 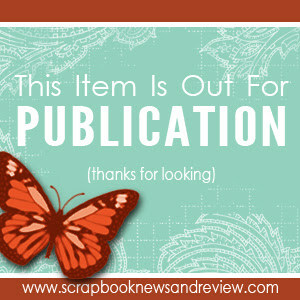 Thanks for checking out my blog and have a wonderful day! This was super fun to create. One of my favorite collections of Christmas papers is the Fancy Pants Hot Chocolate Collection. I rolled the papers and hot glued them onto a 8X10 canvas. The tree is embellished with buttons and brads and I added a snow flake sticker to the top of the tree and adhered a jewel to the center of the snowflake. The sky is created from Pan Pastels and also I cut a pom pom ribbon apart and hot glued some snowballs onto the canvas. The snow on the bottom of the canvas was created by using a Versamark pad and some crystal embossing power of which I heat embossed. 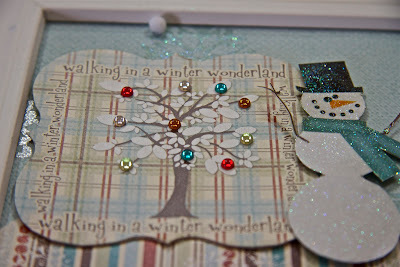 Finally I added a small piece of ribbon to the bottom of the tree to give it more texture and cut a trunk out of paper. Hope you have a great weekend and have some time to get crafty for Christmas! My layout design #131 for Twisted Sketches is posted here today. You will find the sketch here at www.twistedsketches.org. Come play along with myself and the other Twisted Sisters. This year I am making a lot of my Christmas gifts. I made this with a dollar store frame and some scrapbook papers from Fancy Pants Hot Chocolate collection. 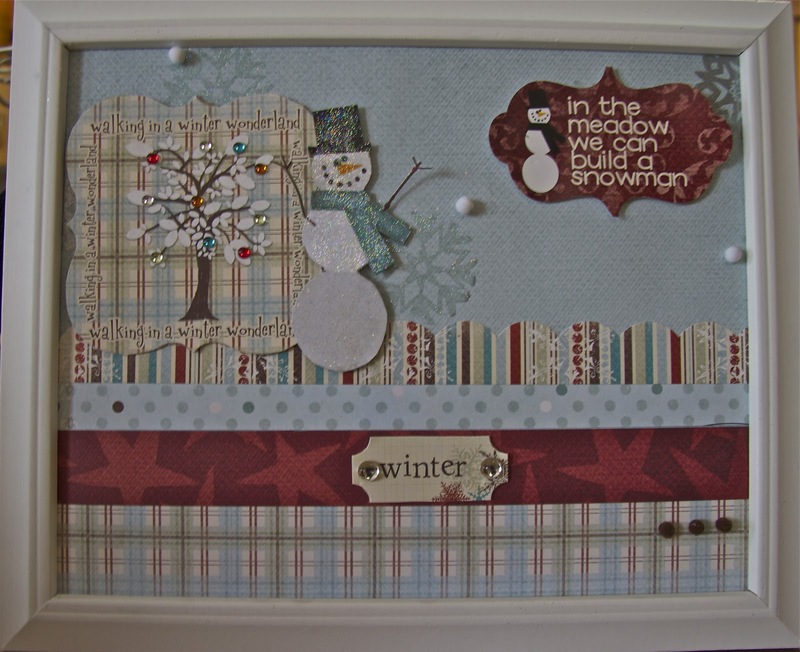 I used some small white fuzzy snowballs from Little Yellow Bicycle and stamped and embossed some snowflakes on the background and the snowman. 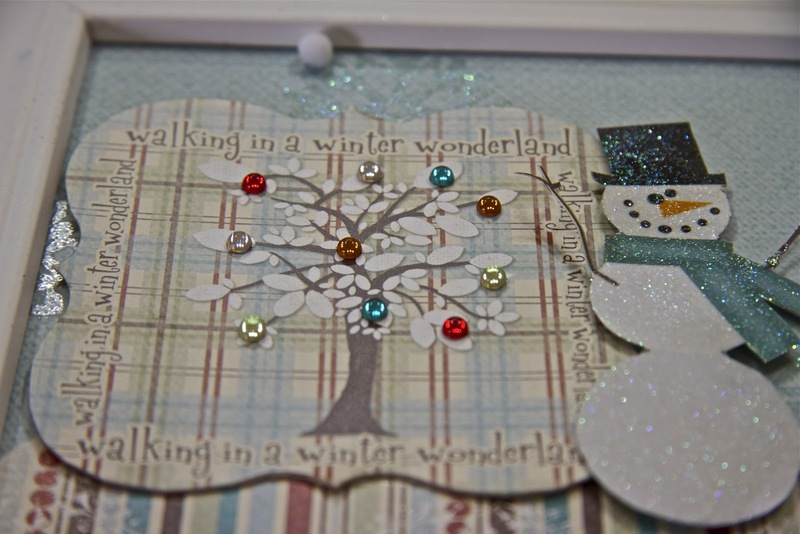 I adhered some clear glass crystals to the tree and the "winter" sticker. It was so fun to do and it really took me only about 30 minutes to complete. I love wreaths and I love Pinterest. 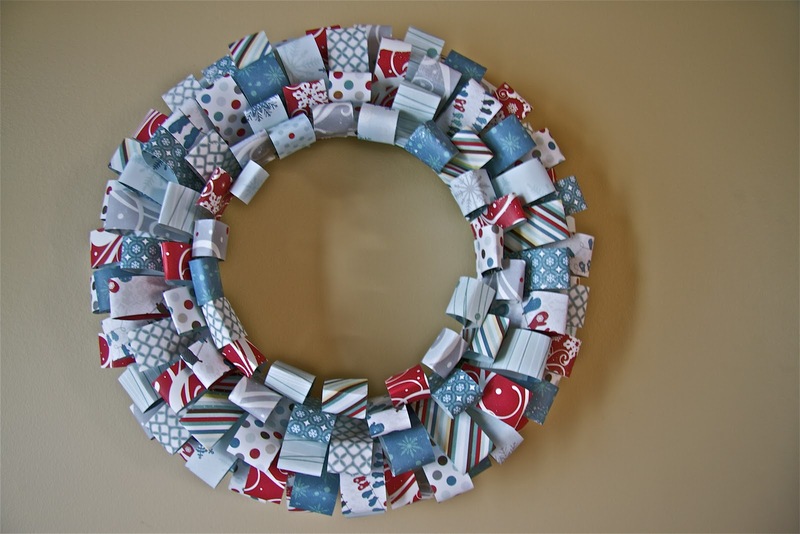 Here are two wreaths that I created that I pinned on Pinterest. The first one was created with the new Echo Park Winter Park Collection. I love the blues and burgundy together. I used my Slice to cut out the stars. They measure 4 inches. I used my Scor-Pal Scoring Board to score the stars to give them more dimension. I used my hot glue gun and adhered all the stars onto a flat wood wreath that I bought in the floral department at Michaels. 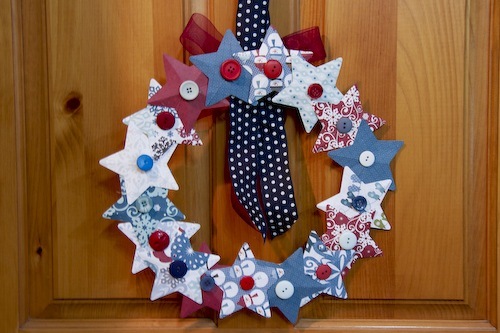 I put a button on each star and tied some ribbon behind the wreath to hang. 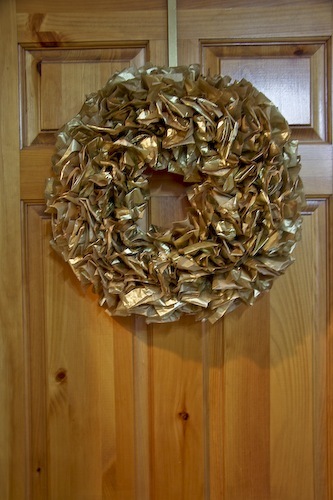 The other wreath I made today is made out of gold tissue paper that I bought at the dollar store. I bought the 12" styrofoam wreath form at Michaels and used my hot glue gun to glue the tissue paper onto the wreath. This was a labour of love but I think the final product was worth it. I hope this inspires you to make a wreath. They are nice anytime of the year!